The whole of the Brigade practised the attack assisted by “Tanks”. Now these are armoured cars only they can go over anything such as trenches and barbed wire. They can even climb straight up, up towards the sky. They are little wonders. Their guns vary from machine-guns to those capable of firing 2lb and 6lb shells. 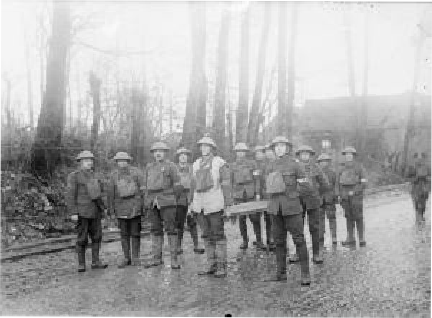 At 3.30 in the morning we were all up getting ready to move at 4.30 a.m. Moving off at the afore-mentioned time, we marched to St Riquier where we entrained for Corbie arriving there at 12.30 p.m. Our stay here did not last longer than a day because we advanced four miles on our new front and men were needed so that we received an order at 1 o’clock to be ready to move by 2 o’clock. Great excitement prevailed when eventually we found ourselves nearing the danger area. Our destination proved to be a re-enforcement camp called “Happy Valley”. It lay just to the left of Bray sur Somme. We arrived here on the 4TH SEPTEMBER 1916. I should just like to say that to establish a camp like this two months ago would have meant death to you but now we have advanced between 7 and 8 miles so that all the ground left and right as far as you can see is nothing else but reinforcements of all kinds. From here we moved very suddenly to the front again. Actual ‘trench’ warfare for us, this journey, was a thing of the past for we took up our position in shell holes. We fought like this for two days, then on the 7TH SEPTEMBER 1916 at 4.45 p.m. we got the order to advance. This we did covering 250 yards of ‘No Man's Land’ and two trenches. These we held all night. I might mention that we lost all the officers of ‘A’ & ‘B’ companies so the companies were led into action by Sergeants W.H. Pearson and Brawn (?Brown) respectively. The former had a very trying time for it was necessary for one half of his company to retire and the other half to leave the “Louse Wood”,(also known as “Lousy Wood” but actually Leuze Wood), as the boys term it, and take over the former half company’s position and re-organise. This was skilfully carried out by Sergeant Pearson without loss of life. Sergeant Brawn, (?Brown), did magnificent work in getting rations, bombs and ammunition to the front line and generally doing good work. Our total casualties were (left blank) officers and (left blank) men. 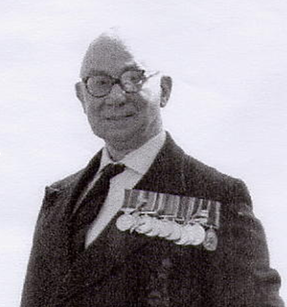 Among the officers killed was the late Major Davies, a prominent Bisley Shot and King’s Prize Winner. The enemy were the 48th Rhine Regiment, and big fellows they were too. In their trench was found plenty of beer, soda water and bread of which our boys partook freely. 8TH SEPTEMBER 1916. We were relieved from here at night arriving at a camp called “The Citadel” at 4 a.m. Here we stopped for a day after which we moved to Holtingswood where our division assembled, being in reserve. Today I saw C. Taylor who had been transferred from the Cyclists to the Royal Fusiliers, also Len Corstorphine who had just seen his brother for the first time in 18 months. From here the battalion went into action at “Angle Wood”, of this I will speak later. Now, owing to advancing, great difficulty is experienced in conveying the wounded from the firing line to the ambulances, so that all the bandsmen have been made Stretcher Bearers and we work a system of relays, that is to say;- when a man is wounded he is dragged from his shell-hole and taken to the regimental dressing station. Here his wounds are dressed, he is then placed on a stretcher and four men carry him to Leuze Wood which is the first relay. Four fresh bearers then bring him along to Angle Wood where we pick him up and take him under shell swept ground to the “Crucifix”, (?Crucifix Corner), here he is picked up by fresh bearers and taken to what was a village called “Hardecore”. Here he is placed on an ambulance and taken to hospital. Now, to describe the surroundings. Imagine a village full of life, children playing in the streets, just outside the village in the fields cattle are wandering about. Now imagine, if you can, the same village in war time as I saw it. The village itself is reduced to the ground, not a single stick is left.The only life in the place is in the cellars where soldiers rest. The fields are absolutely one mass of shell holes of all sizes. Here and there one sees a shell unexploded. These vary in size, some of them being taller than a man. Ruined guns and cannon of all descriptions lie partly embodied in the earth, rifles and equipment of English, French and German type litter the ground. Also one comes across the grave of some brave soldier who has been killed and has been buried by his chum who erects a simple wooden cross to his dear comrade's memory. In other places I saw a mound which contained one or more unidentified men. Their grave was merely marked by a rifle stuck muzzle first into the earth and a shrapnel helmet on top of that. Up near the first line of defence bodies are still where they fell, in a wicked state of corruption. English, French and German are all scattered about the place. Can you imagine it all? My God, what a sight for one to see! People in England read of battles and descriptions of battle-fields but to see them in reality is quite another matter. Then we come to wood fighting. People read accounts of this and say how splendidly we have done but what of the cost? Take Angle Wood for instance. Imagine this, a fine wood of small undergrowth and tall stately trees, full of singing birds. A battle rages in it with hand-to-hand fighting and you next see the trees lying flat on the ground. The ground itself is a mass of shell holes - in fact the whole place denotes death. My regiment have been in action for a week now, sometimes up to their necks in water and when the sun comes out strongly they lie exposed to the enemy and mad with thirst. This brings me to 23RD SEPTEMBER 1916. Now it was on this memorable day, 23rd September, that I missed certain death by five minutes. I will tell you how it was. We, the buglers of the Queen Victoria's Rifles, had been at Angle Wood stretcher bearing. We were relieved by the drums and fifes of the 2nd City of London Royal Fusiliers at 10.30 a.m. and had just left the dressing station when, at 10.35 a.m., two German howitzer petrol shells dropped clean into the place where I and my boys had been sitting. The Fusiliers had 2 killed and 9 wounded and the Middlesex band had 7 wounded. So you can well imagine what it means to have “Luck” on your side! Now to speak of the Regiment. They have been up in the trenches for 14 days during which time they made two attacks, being successful each time. During this fortnight Combles was taken. This was a very clever move on the Allies’ part. My division were in front of Combles and I believe it was our lot to take the place but instead of that, the division on our left and the French on our right made an advance and joined up behind Combles thus leaving our division out of the fun altogether. We were walking about and doing just as we liked and not a shot came at us. The enemy had retired 2 kilometres. When our troops reached Combles, gas was laid on ready to send over to us but we were just too quick for them. Naked girls and women were also seen both in the German trenches and in the town of Combles itself. Our division was relieved and we spent two days at Meaulte after which we moved up to the line again in reserve and on fatigues. We are living in our old front line and the German front line of trenches. This brings me up to the Sunday, 1ST OCTOBER 1916. From this date until the 10th we were both in reserve and the front line after which we moved to Mansell Camp near Mametz. Here we stayed for two days. At 3.30 a.m. reveille went and at 5 o’clock we were on the march to Treux where we got on French motor lorries. These landed us at Picquigny after about 4½ hours ride. We spent our first day cleaning up and removing all traces of the terrible Somme district. Our second day was spent in inspections. It was here that I was promoted Corporal. 24TH OCTOBER 1916 to Lestrem. We left here on the 27th and went to Bout Deville. Here we stayed one night and then proceeded to La Gorgue. 12TH DECEMBER 1916. Back to London for Leave.